The Pizzaioli 100 white with SS door is available for pick up from our Melbourne and Brisbane depots. 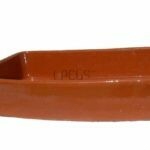 Can be shipped anywhere, just ask us for the best delivery options. As the name suggests, this is our special wood fire pizza oven. 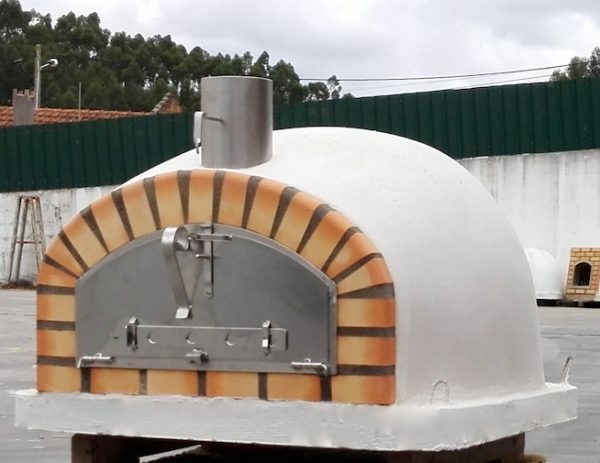 The design of the lower dome allows for the heat reflect to faster to the oven floor, making it ideal for the perfect wood fired pizza, but also for beautiful roasts, potato and vegetable dishes and other recipes and of course the tastiest bread you ever had. 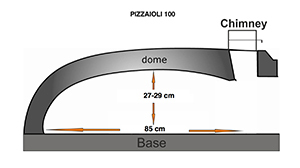 The recipe booklet that comes with your pizza oven has Giuseppe’s pizza recipe and many other ideas. 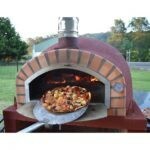 This pizza oven is the finishing touch of your backyard and looks great as a stand alone on a brick or wooden stand or as part of your entertaining area or outdoor kitchen. It can be outside as the new finish protects it from the elements and the chimney outlet and door are in stainless steel. 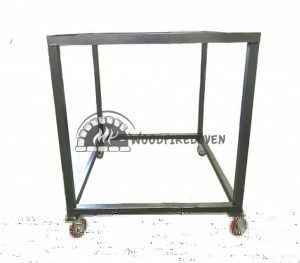 However, just like with a bbq, use an oven cover if you don’t use it for a while or in rainy seasons to avoid that the bricks inside the dome absorb humidity. 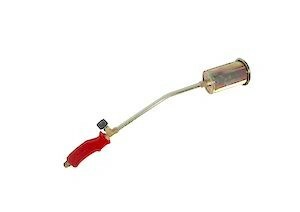 Or you can set it up in your patio, under an awning or on your verandah. We have extension chimneys to go through the roof if needed. This new version of the Pizzaioli Classic has the door structure (inside the oven), the chimney outlet and oven door in stainless steel instead of zinc electroplated steel. Many customers live close to the coast in which case stainless steel is a better option. 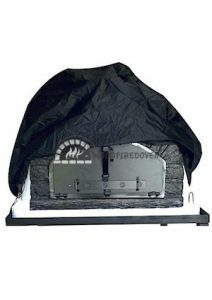 Furthermore the new Pizzaioli ovens have a new stronger structured coating and they will come in white. 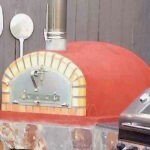 However if you prefer your oven coloured we will supply a high performance acrylic outdoor paint for free in the same colours as our pizza ovens with Cork finish. The Pizzaioli 100 white with stainless steel door is available for pick up from our Melbourne and Brisbane depots. Can be shipped anywhere, just ask us for the best delivery options. 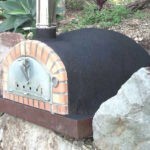 I purchased a black pizzaioli woodfired oven for my husband just before Fathers Day. We had it delivered to Mudgee. We absolutely love the oven Thank you. The pizza dough recipe is beautiful and is definitely the recipe we will continue to use. Im going well thanks hope you are too!! Thank you so much for your offer to send out a new dish, that would be perfect! We use our wood fired oven all the time. My husband loves it and says its the best present he has ever received. We’ve got the pizza bases perfected but need to find a good sauce recipe still and are still trying to master slow cooking (ribs) and roasting but getting there. My husband loves it ( he’s the wood fired oven cooker ) The oven is getting a good work out which is good , mostly cooking pizzas though. Thank you so much for contacting us and sending the dish out for us. It is really appreciated!! We cooked in our Pizzaioli last night for the first time. I spent a bit longer curing it. 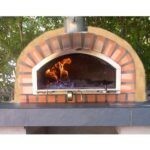 What a beautiful pizza oven, we are so pleased with it and your service. I hope they are not trying to squeeze more out of you? Let me know if I can assist in any way. Yes the pot arrived on Saturday. I am so in love with the oven! Chicken schnitzel , Beef Rague, Turkish bread, Pizza , Pork roast … the best succulent great crackle roast I’ve ever cooked. 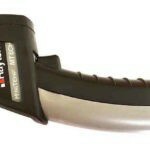 I could not recommend you and your product more highly. Thank you so much. Please see attached my pics. 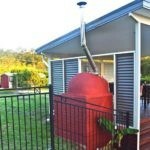 Absolutely love my new pizza oven it has completed my out door area and how good are the pizza’s amazing. Thankyou for all the information on how to cure the oven properly and also cooking tips. Have a couple of external cracks when oven is hot nothing internal so all is good. 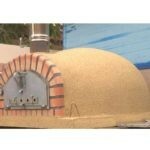 Thank you we are extremely pleased with our pizza oven the Pizzaioli. Hi and thanks so much. You have been a great help throughout the process. Definitely happy to share some photos once installed! ps had forgotten about the curing so glad you reminded me. So looking forward to those first pizzas! Hi, We’ve used our pizza oven a few nights now. Been fantastic. Made 30 pizzas one night last week. Was a big hit! I’m always happy to hear pizza dough recipes. So always forward them to me.